Until we figure out how to make a pair of fins and a seashell bra appear by snapping our fingers, our vast selection of mermaid costumes is the next best thing. Featuring an array of holographic fabric and accenting sequins, frills and iridescent ribbon, undergoing a mermaid metamorphosis is a great way to make a splash at any festivity. Since your appearance and aura will be undeniably enchanting, it's only natural to want a completed head-to-toe look. Since there's no way of getting around the fact you have feet instead of fins, you might as well match your footwear with your sea siren ensemble. 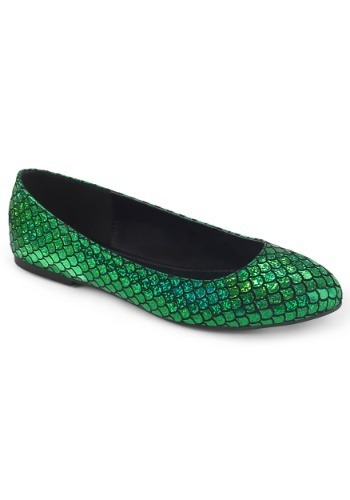 The women's green mermaid shoes offset any shell crown or shimmering fishtail maxi skirt. They're pretty much mer-mazing. Sport a pair of flats with your costume and give your feet a nice break from wearing heels. The comfortable shoes are glittery green with black scallop shapes throughout, perfectly imitating the appearance of scales glistening in the reflection of the water. King Neptune personally approves of these shoes because they're great for dancing. It turns out, all mer-folk are big fans of dancing since busting a move underwater is fairly difficult! Size 7 Footbed (heel to toe) 9.25" 9.25"
Size 8 Footbed (heel to toe) 9.5" 9.5"
Size 9 Footbed (heel to toe) 9.75" 9.75"